USB Network Gate is a software tool that allows you to access USB over LAN, as well as WAN and Internet. It makes possible to share a local device or access a remote device as if it were inserted in a local USB port. You thus can allow other users in your network to use a webcam connected to your machine or send documents to an office printer while working from home. USB Network Gate is a cross-platform solution, e.g. 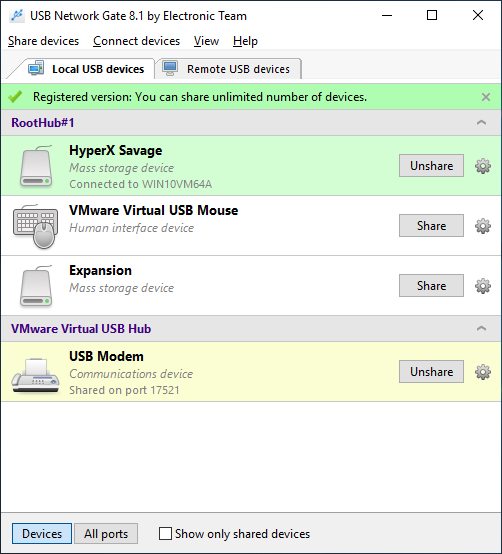 you can share a device on a Windows machine for other users to access it from a Mac machine or a Linux device. With USB Network Gate you can insert a device into a local port and enable network computers to reach to your USB over LAN. Other network users can reach out to your printer, scanner or any other USB device with minimal effort. Their actual location – across a cubicle or across the globe – won’t make any difference. It works the other way round too - USB Network Gate allows you to access a remote device over network. Need to browse the contents of an external hard drive attached to your colleague’s machine? No problem, ask your colleague to share it with you. Users can add a password to regulate remote access. The same problem persists when you work over RDP – you will not see USB ports of a remote machine. USB Network Gate here acts as a USB to LAN connector – it enables detecting and connecting to available USB devices automatically, as if they were plugged in the remote machine directly. Remote USB ports and devices connected to them can be accessed over existing wi-fi network. No additional configuration is required – share a USB device and other users can access its contents or functionality immediately. USB Network Gate allows you to provide exclusive access to a specific user for one session; a shared device is available only to them. No one else can use it during the session. USB Network Gate 7.0 and later versions work with ICA protocol by Citrix. Whether you are considering enterprise-wide usage of USB Network Gate or redistributing USB redirection engine as a part of your software solution, you'll find it here at a reasonable price with the most personal attitude and exceptional quality. USB Network Gate (former USB to Ethernet Connector) easily connects one or more remote USB devices to your computer over Ethernet. Before using your USB to LAN Connector I had no way to share USB over Ethernet. You guys did an awesome job developing a software like this! Remote access saves our customers so much time and worries about when they will be getting their phone back. Using USB Network Gate is like having the remote phone on my desk plug into my computer.